MOLLUSCA : NUDIBRANCHIA : Lomanotidae SNAILS, SLUGS, ETC. Description: The body of this nudibranch is translucent white and mottled with brown and white pigment. Pure white individuals may also be found. The cerata-like processes are arranged along the edge of the pallial rim, the tips of these processes are swollen, with mucronate tips. The adults may grow to a length of 34mm. 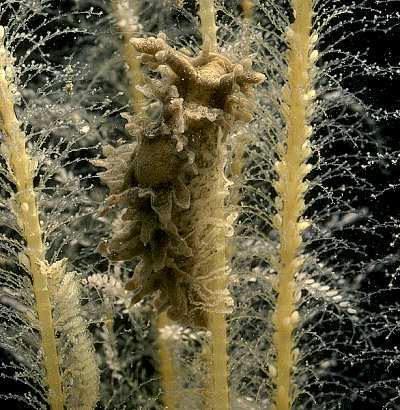 Habitat: Lomanotus marmoratus is usually found feeding on the calyptoblastic hydroid Nemertesia antennina. The adults often hide at the base of the Nemertesia colony. 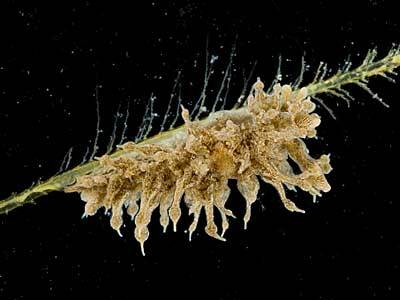 The spawn is a semi-transparent string of eggs laid in a tight zigzag along the stem of the hydroid, and is very distinctive. Distribution: Records exist from all around the British Isles and south to the northern coasts of Spain. Recent records include Strangford Lough and the Isle of Man. This species is inconspicuous and under-recorded. Similar Species: Occasionally small individuals which are probably Lomanotus genei are found which are almost colourless, lacking yellow or red pigment. These are difficult to distinguish from Lomanotus marmoratus and may be a distinct species. Swollen tipped cerata arranged along the pallial rim. Body normally mottled with dark pigment, occasionally unpigmented. Picton, B.E. & Morrow, C.C. (2016). Lomanotus marmoratus (Alder & Hancock, 1845). [In] Encyclopedia of Marine Life of Britain and Ireland.